Intelligent two-way communication. That’s all. Animals communicate. Geese and mamba. The various creatures on this earth are continually communicating in one way or another. They have to communicate don’t they? Without communication, how would they get through their day, announce their presence, locate or warn each other, find food, teach others new skills or choose a mate? How does a huge flock of birds, spanning hundreds of metres in area, suddenly change direction in mid-flight, without any audible or outwardly visible signal? How about a massive underwater cloud of fish that flicks its collective tail and does a right-angle turn in a nano second? Amazing! Maybe I’m wrong, but I think that most of us probably take in our stride, much of the chirping, buzzing, croaking, snorting and colour flashing that goes on around us, without giving it a second thought, but there’s no question, that despite what we might think, even if they’re blind, deaf, limbless or mute, they’re communicating. I’ll exclude hom-sap from that generalisation – we’re far more advanced aren’t we, we use cellphones. But perhaps not all creatures are openly communicating: snakes for example, probably because they’re primarily predators, advertise their presence a lot more subtly and specifically, because with few exceptions – warning signals is one of them – they don’t actually want others to be aware of their presence. For them, communication cannot be sound-based, so it needs to be conducted through other means, principally movement, touch and smell, and this is where, if you’ll excuse me, snakes have to be on their toes. Don’t for one minute think that the assumed paucity of snakes in a given area indicates their absence; no sir, in most cases, they are about in numbers, yet they have the amazing ability to remain almost invisible. Snakes are attracted to each other via pheromones. 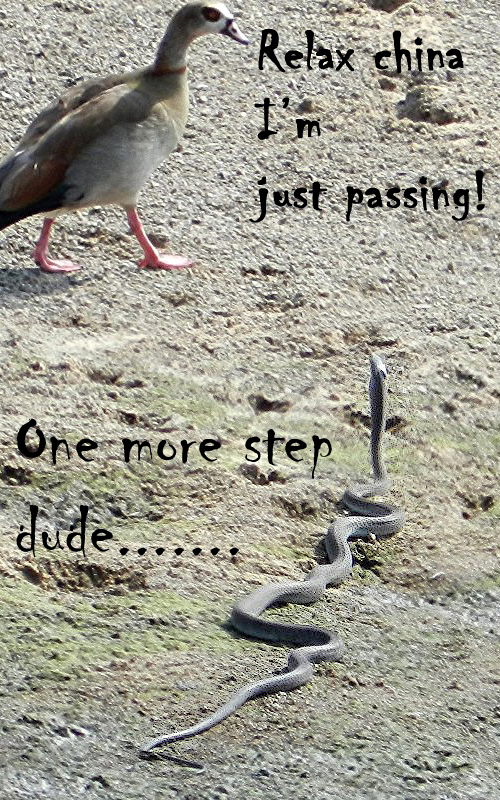 As I’ve said in previous articles, snakes are pretty adept at staying out of our way. Their continued presence on this earth since long before the arrival of man, is testament to their success, quite amazing considering the fact that they’re technically deaf and voiceless, two of the obvious elements of communication. They’ve had to avoid just about every other thing about them that is out to annihilate them, or carry them away for commercial use, medicinal, pet trade or other. Whilst doing the things they do best, snakes give their enemies little in the way of indication as to their proximity, and provided they’re not sleeping, they seem uncannily aware of our presence long before we are of theirs. There are those snakes, and they’re in the minority, that will hiss, make a hood, spit or rattle their warnings to interlopers – but this only when they feel exposed or threatened. 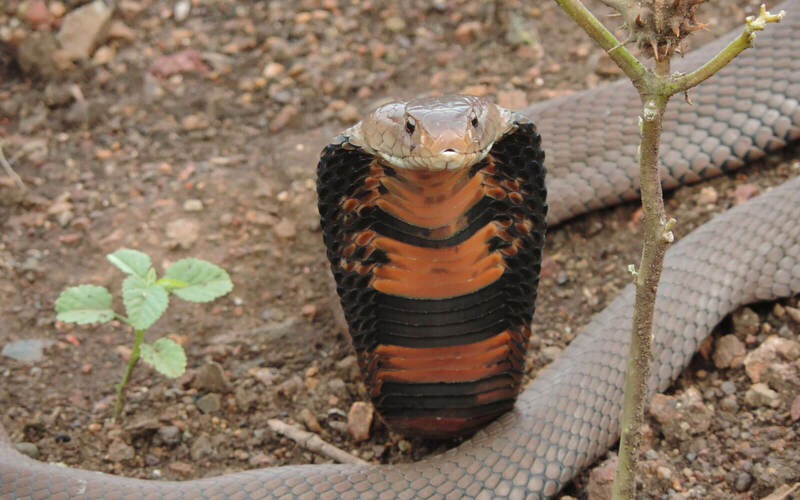 Mozambique cobra displaying its hood. They’re also not that reliant upon colour or showmanship as are many other creatures, to gain attention in their world. So if they don’t hear us, how do they know we’re around? We surely need to revisit that long-held belief that snakes rely purely upon their ability to feel vibrations via their lower jaw as we approach them (see the note on hearing – below). In this respect, I’m sure that a lot will depend upon the surface of the surrounding area and its ability to transmit the vibrations of the approaching animal. 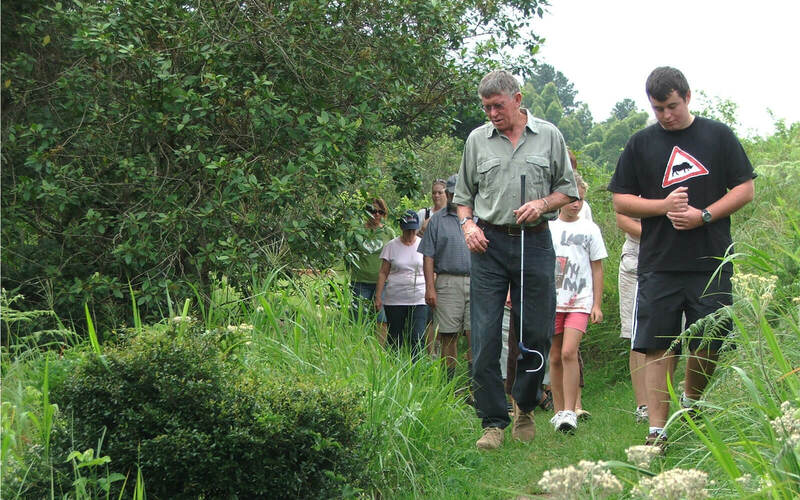 Some people believe that a bit of foot-stamping as you go through the veld, will alert every nearby snake to your presence – a tad irritating for those who are trying to enjoy an hour or so in the African bush, listening to bird, frog, or insect calls! Field group in the Conservancy. 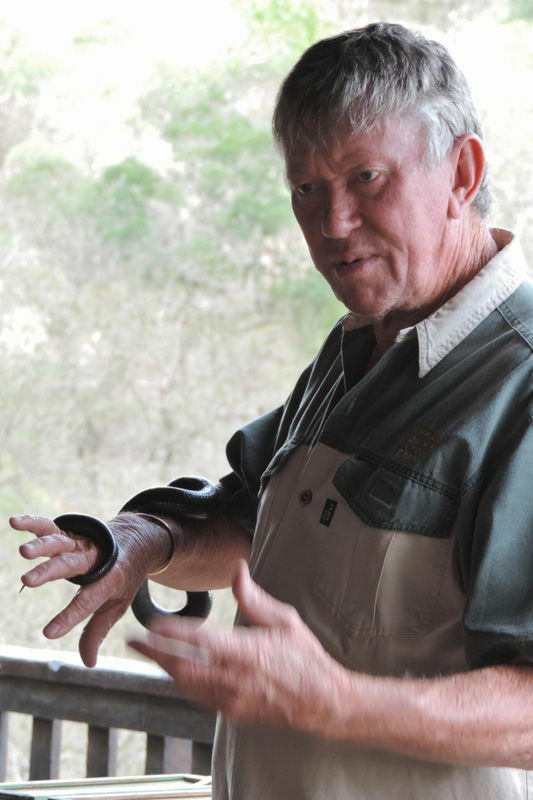 That belief may have merit in some situations, but through experience I’ve gained whilst working with three common species, Puff adder, Brown House snake and Night adder, I’ve no doubt that they have an amazing ability to detect my presence, even in situations where I’m confident that in many cases, ground based vibration was not a factor. How do they manage to sense/feel my presence? I’ve included additional research in my efforts to try and nail down some answers, and some of my assumptions that follow might be considered to be subjective, but I had to start somewhere. I’d welcome input from interested readers because for me, any day without learning something new, is a day wasted. It’s important to understand that as much as we like to think otherwise, we don’t actually know everything. In terms of animal behaviour, there will be things that people have seen, but that are probably yet to be documented – either because they were thought to be unimportant at the time, or perhaps it was felt that others had seen the behaviour previously – and it wasn’t felt worth mentioning. Let’s look at some of the ‘equipment’ that snakes have at their disposal in order for them to detect motion, and see if that answers any of my questions. Short-snouted sand snake, smelling, looking, feeling its way around. 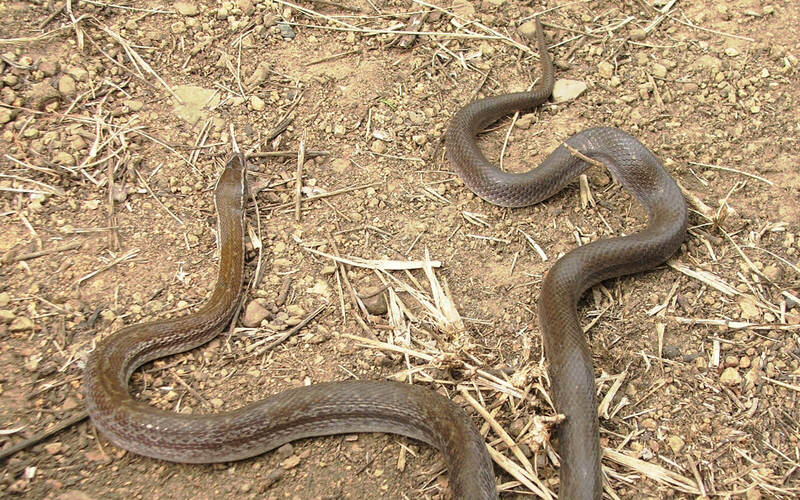 Apart from the fossorial species where good eyesight is not necessarily important, most other snakes have eyesight that ranges from average to good, although they do not register colour. We assume those snakes with elliptical pupils, to be equipped for night vision, making the term ‘Night adder’ (Causus rhombeatus), which has round pupils, perhaps a misnomer. Night adder eyes. Round pupils. 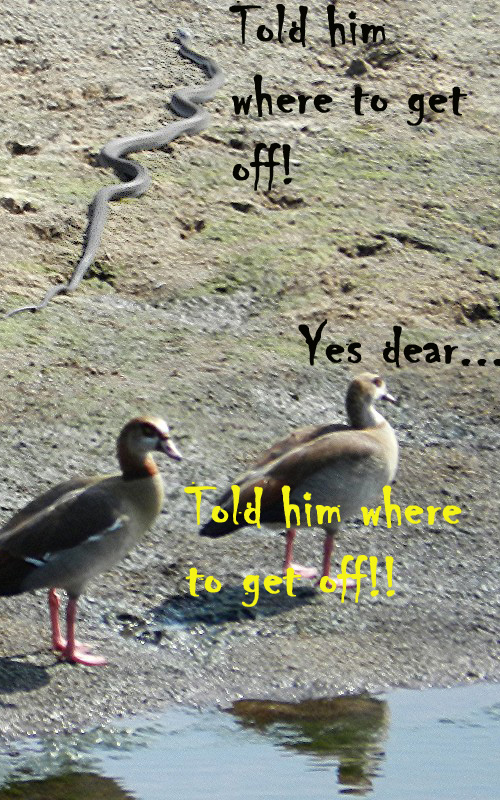 Snakes do not have the full field of vision that warm-blooded animals generally have, and when we’re up and close to them they seem to rely principally upon the detection of movement – hence rule number one when encountering snakes, no matter what species: Stand still! Spotted bush snake outstaring the camera. Cobras (Naja spp.) and to some extent mambas (Dendroaspis spp.) 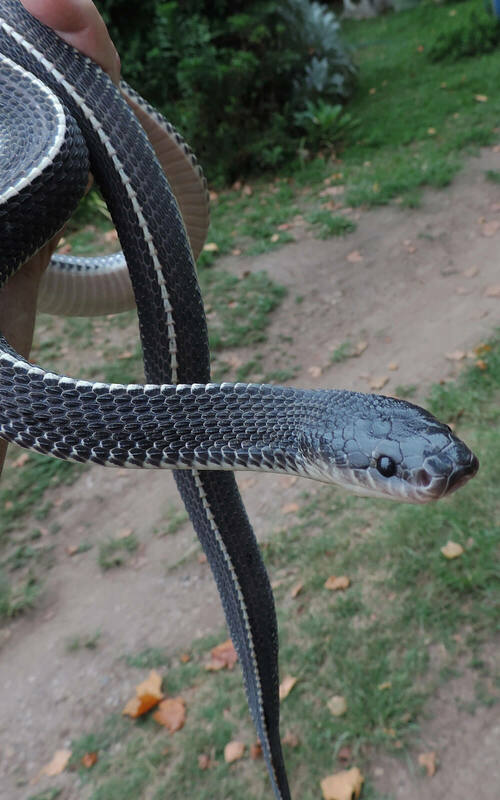 are examples of snakes that seem more acutely aware of movement, possibly because once they raise their forebody in the defensive mode, they can be seen to move their heads to look directly at the aggressor, following its movement. 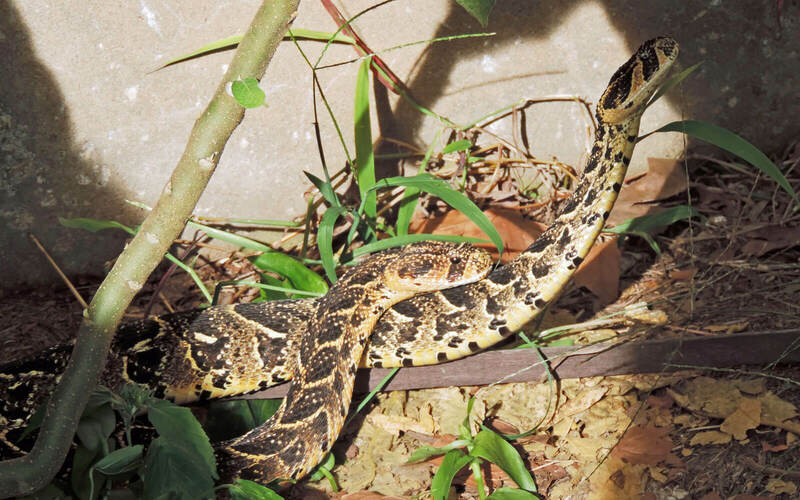 It probably stands to reason, that those snakes that remain close to the ground – especially in thick bush or amongst the rocks, are less likely to notice movement and react to it. 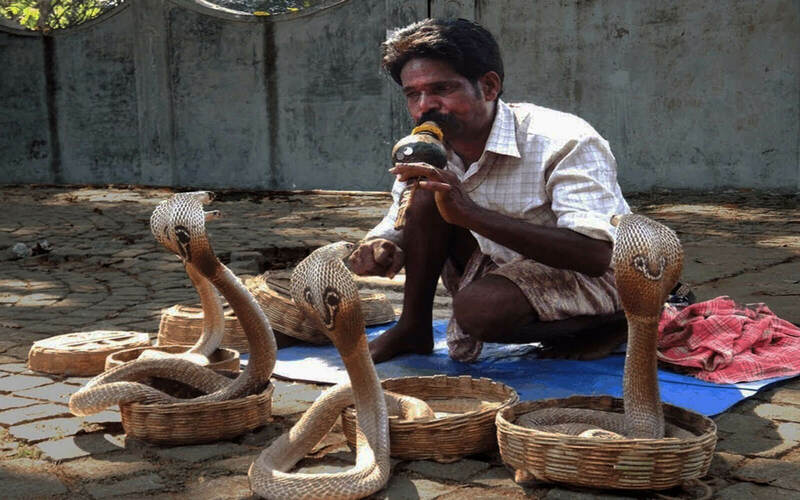 The famous Indian Snake Charmers use large cobras – often the Spectacled cobra (Naja spp.) – to entertain their audiences. At the start of the show, when the charmer removes the lids from the baskets he’s placed in the market square, the cobras emerge, standing erect, full of attitude with their hoods spread wide, and then appear to react to the music of the flute pursed between the lips of the charmer. Whilst playing his music, the charmer moves around the baskets, and as he moves, the snakes watch his movements – they don’t react or listen to the music. Remember, snakes can’t hear. Ok, so although they don’t have ears and technically can’t ‘hear’ in the recognised manner, they still have the basics of vibration-receiving equipment in their heads. Stapes, small bones connected to the lower jaw, transmit vibrations – ground and air-borne – to the brain. Bearing the above in mind, although it might make sense that snakes up in trees or atop grasses are less likely via this means to identify ground vibrations, one only has to lightly tap a tree containing a nest built by Cocktail ants (Crematogaster spp.) 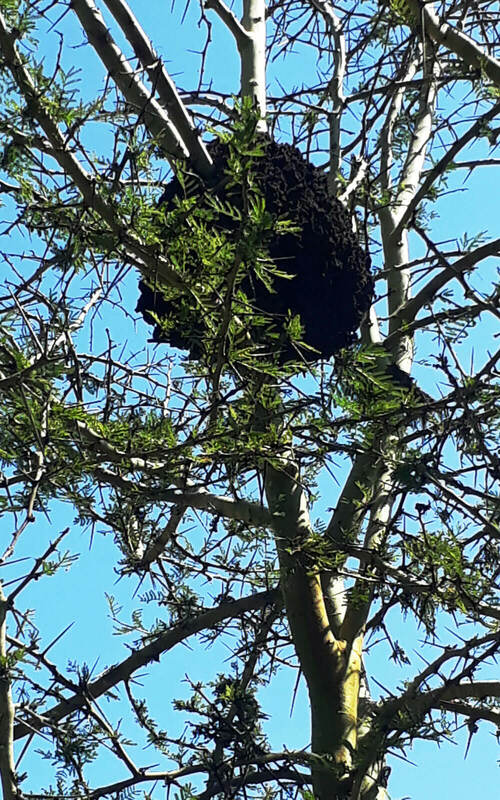 to witness the frenzied activity from the ants that ensues right up and down the tree, almost simultaneously. This confirms for me, the degree of sensitivity that many animals have to what could be termed ‘threatening’ situations, and based on their ability to stay out of our way, I’d guess there’s no reason to assume that snakes don’t have a similar degree of sensitivity. 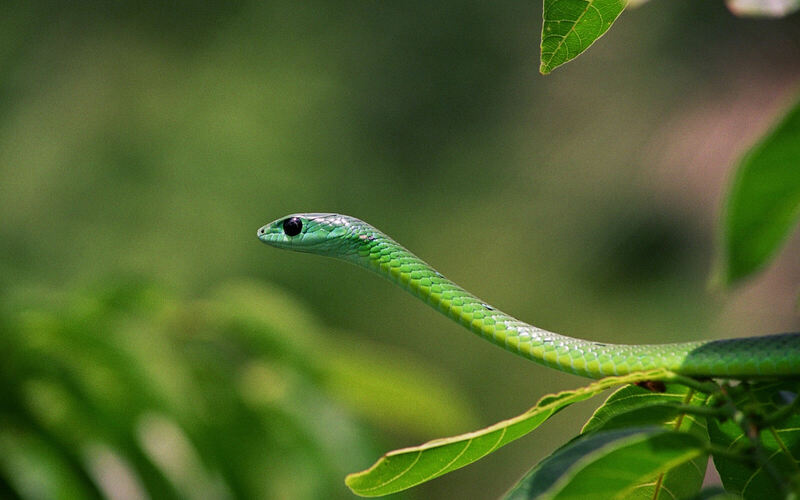 Natal green snake high up in a tree. Green mamba checking out the scene. In addition to the above, another way in which snakes would be able to ‘hear’ vibrations would be throughout their bodies. 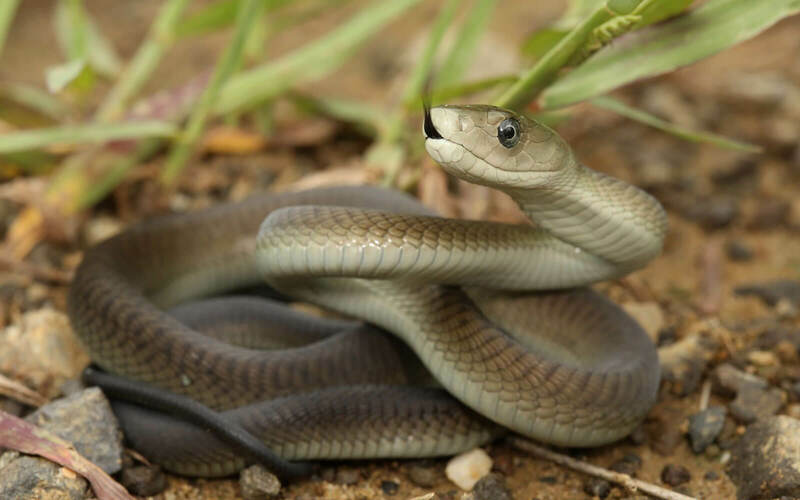 Unlike other animals that have the bulk of their bodies suspended above the ground upon appendages which transmit vibrations, snakes cover the entire ground with the ventral part of their bodies – the belly – which in turn is covered in sensitive scales. And we can’t ignore the hundreds of ribs beneath those scales, which are also capable of transmitting vibrations. Brown house snake taking it all in. 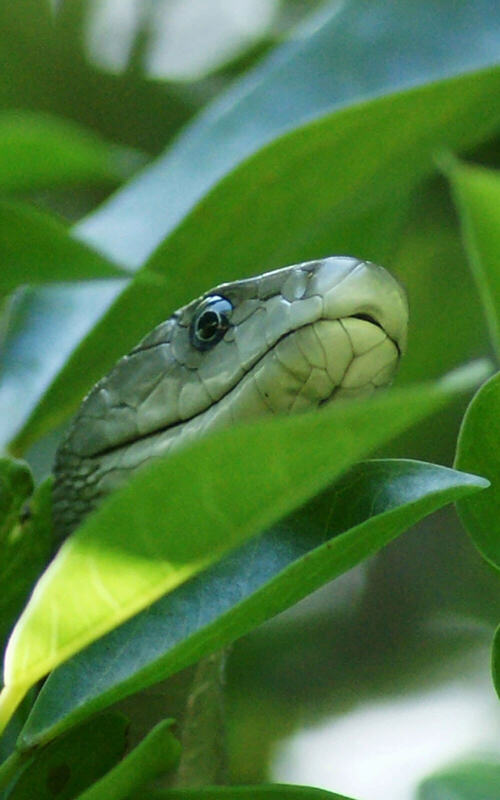 Rattle snakes – also referred to as Pit vipers – have heat sensing hollow ‘pits’ located in the lip area, that enable them to determine not only temperatures, but also distance from their prey – another example of technology we’ve ‘borrowed’ directly from nature, to give us our technical edge. Some of the world’s pythons and boas, including our python, Python natalensis have similar pits. 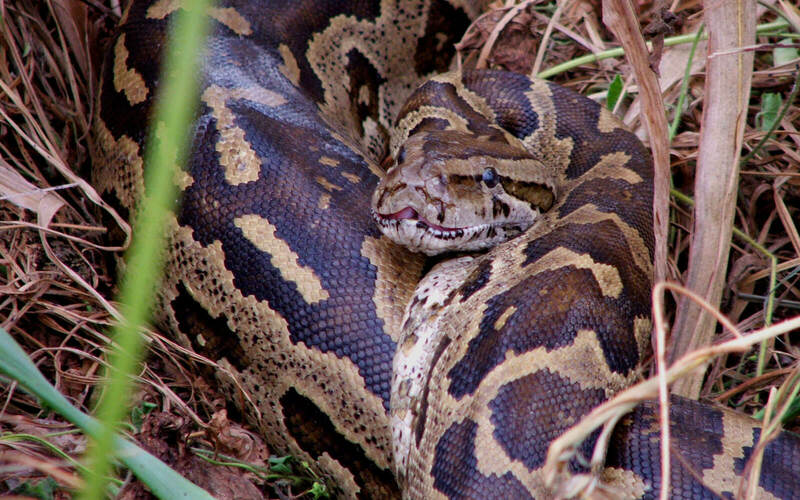 The Python’s heat-sensitive pits are visible on the upper lip, below the nostrils. Research has been going on in respect of this particular aspect of reptilian sensitivity since the 1930’s, and in the late 1960’s, a herpetologist, Proske, carried out extensive studies on the shed skins of various American species, looking specifically at what are known as ‘pits’ and ‘tubercles’, which can be found in the scales of many snakes and lizards. The studies were aimed at trying to determine what function these served in the creatures that possessed them. 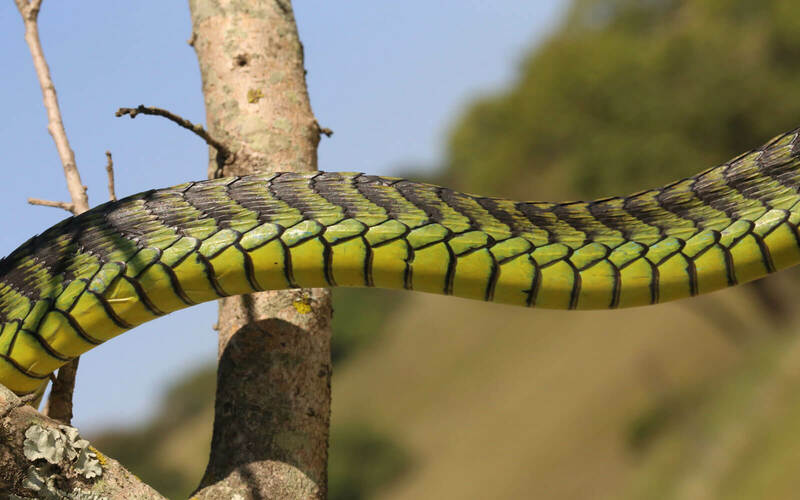 The scales of a male boomslang. Scales of the Cape File snake. 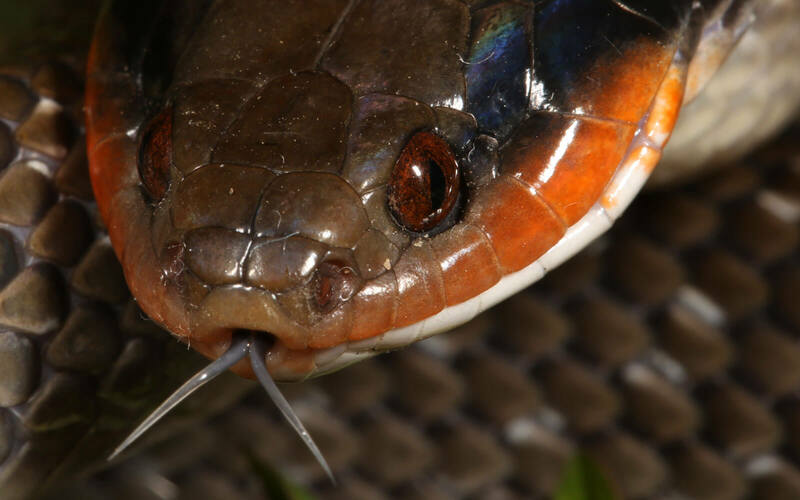 Proske published his findings in a 1969 paper, concluding amongst other things that “the possibility of a sensory or tactile function for apical pits in snakes should not be ruled out. Regardless of their function, the enormous amount of inter and intraspecific variation in the occurrence of apical pits is puzzling”. In alluding to the fact that the snakes he had studied, had some clever, as yet to be determined, equipment embedded in their scales, he was surely calling for greater research. 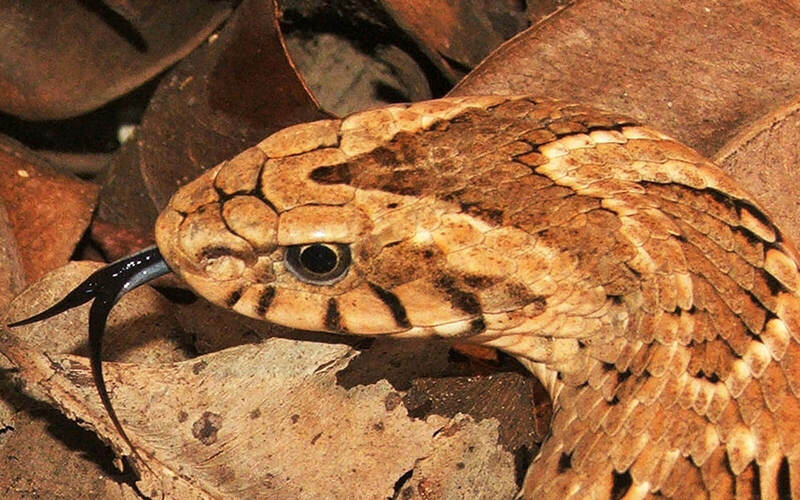 So through research, we’re learning more and more about how snakes can isolate such things as heat sources, light sources and air pressure changes, giving us no reason to doubt that most, if not all snakes, possess some of these info-gathering faculties to a lesser or greater degree, giving us every reason for greater research. 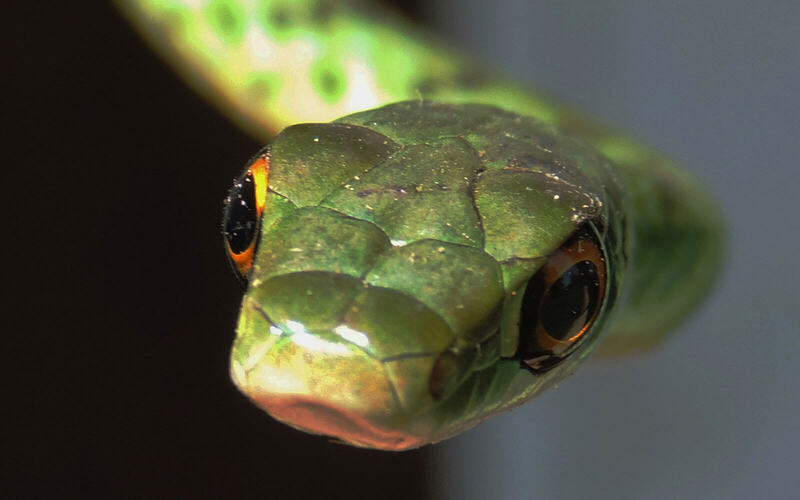 Snakes have nostrils through which they take in air and the smells of all around them. In addition to this, they have the amazing organ of Jacobson, situated in the roof of the mouth. The organ has two pits, into which the snake inserts its two tongue tips, which carry the chemical information gained from it surrounds. This information is downloaded via nerve branches, to the main olfactory nerve which analyses the scent and sends the necessary messages back to the animal. Friend, foe, food, interesting? Whatever it be, the snake reacts. 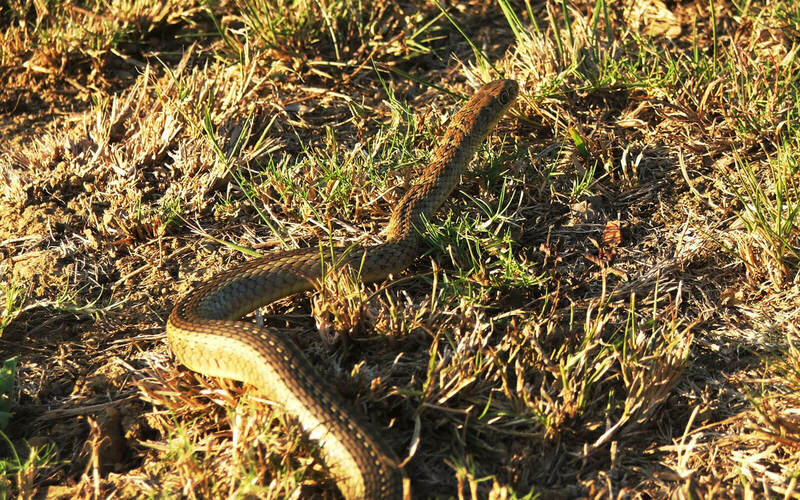 Sit for a moment, relax and marvel at the movements of an undisturbed snake in action – ignore the standard humanoid anticipation of certain death – and you’ll notice the tongue flicking in and out, collecting all the information it can, from ground and air-borne chemical signals that are invisibly in abundance. This could be likened to the actions of us humans, walking through town and suddenly picking up the scent of freshly baked pies from a nearby bakery. If we weren’t hungry before that, our senses will soon tell us that we are in fact very hungry, pointing us – via our noses – to the source of the smell. Scientific research – or for that matter, any kind of research, being what it is – often forgoes the niceties and protocols in its quest for answers, so the following story is not for sensitive readers: In order to determine the veracity of the assumption that reptiles with forked tongues used them to gather information, scientist experimented by removing the tips, or the entire tongue from the animals they were using as controls, and then released them back into their standard environment. The results were pretty sobering. The animals could no longer detect food, find their way around a previously inhabited area, or recognise the scent of like species. Thankfully, now that they have other ways of obtaining the answers to their questions, scientists seem to have canned that type of research. So there it is folks; my 10c worth on how snakes continue to survive in this unforgiving world. 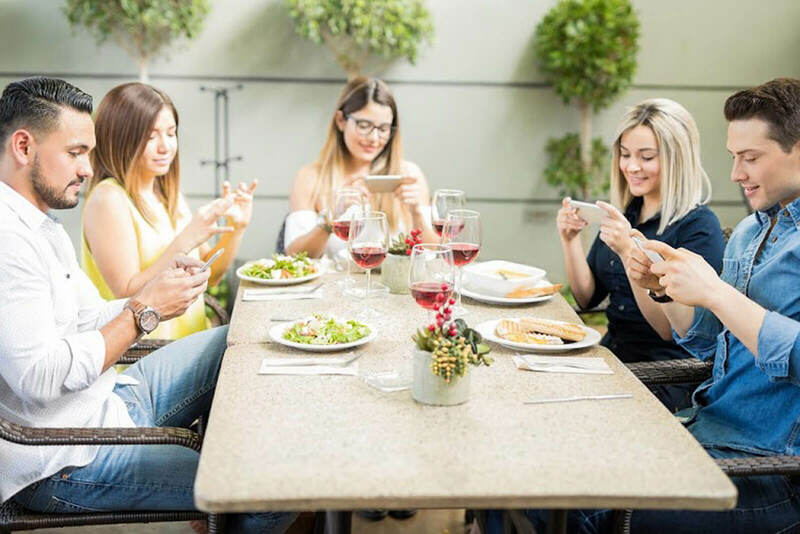 How they determine our presence, find their food, a mate, or a home, and how they manage to communicate meaningfully – without Google, Twitter or WhatsApp. A 21st Century friendly get-together. Learn more on his website, Snake Country.